The Zena Forest is the largest contiguous block of forest in the inner Willamette Valley, and has been managed by the Deumling family since 1987 with a focus on maintaining a healthy and diverse forest ecosystem. It is certified by the Forest Stewardship Council, and is protected by a conservation easement as working forest in perpetuity. The forest, which is only a few miles from downtown Salem is home to a number of threatened and endangered species, as well as the beginnings of three watersheds. Operating in conjunction with the forest is Zena Forest Products, a family owned sawmill. Our sawmill turns logs into high quality wood products and demonstrates our commitment to economic and ecological resiliency and a robust local economy. 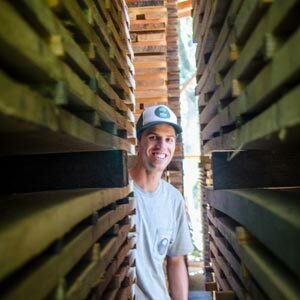 We sustainably harvest our Oregon White Oak, Western Bigleaf Maple and other native hardwoods to manufacture durable solid hardwood flooring, and high-grade lumber for furniture and cabinetmakers. The sawmill is a crucial part of our forestry operation, and allows us to find the highest and best use for all of the wood products the Zena Forest has to offer. To learn more, please visit Zena Forest.